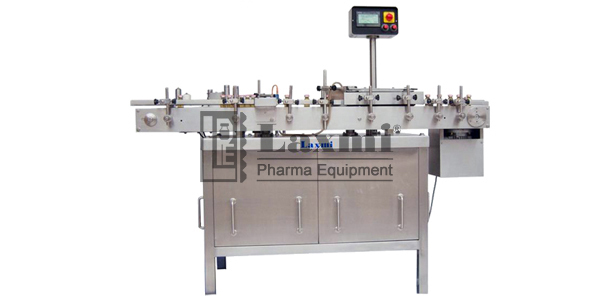 Laxmi Pharma Equipment offers Automatic High Speed Sticker Labeling Machine Model: LSL 200R, user friendly, Vertical Linear Sticker Labeling machine suitable for labeling round containers which are previously filled and sealed. No change parts are required for change in container size. As the machine is servo motor operated, a customer has an added advantage to run the machine with a minimum required output to maximum of 200 Labels per minute but depending upon the Label Size and Quality.